Boasting magnificent architecture and decor, the Alvear Palace Hotel is a luxury historic destination in Buenos Aires, Argentina combining European elegance, opulent accommodations, cutting edge technology, and impeccable personalized service. Situated in the elegant neighborhood of La Recoleta, the hotel is surrounded by the best restaurants, antique shops, boutiques, and cultural centers of the city. The hotel was originally built in 1932 to accommodate the flourishing number of luxury travelers that remain enthusiastic today. Reflect warmth and distinguished comfort, Alvear Palace Hotel features refined decor, luxury amenities, and unrivaled service to accommodate the needs of every guest. 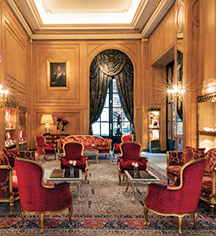 Alvear Palace Hotel, a member of Historic Hotels Worldwide since 2014, dates back to 1932. 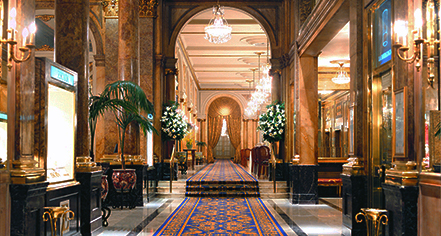 Alvear Palace Hotel was built to accommodate the burgeoning European visitors to Buenos Aires. Boasting magnificent architecture and decor, the Alvear Palace Hotel is a luxury historic destination in Buenos Aires, Argentina combining European elegance, opulent accommodations, cutting edge technology, and impeccable personalized service. Learn more about the History of Alvear Palace Hotel .